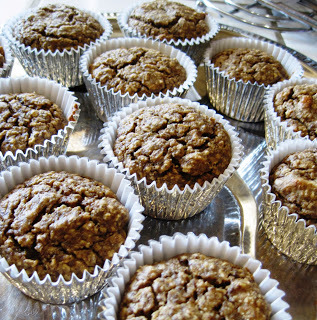 Muffins - with healthy omega fats, fiber, and protein - tasty, too! I have created a MUST BAKE for you and these muffins are absolutely delicious! They are moist, and contain very important nutrients we should all be consuming daily. These power-packed tasty treats house the fabulous Omega 3 fatty acids proven to reduce the risk of heart disease and high blood pressure, only some of the many health benefits. Did you know you should include 25-35 grams of fiber daily? Many of the ingredients in this recipe add to that daily amount. The protein in these muffins is an added boost. Start your day with this healthy and tasty breakfast. And, consider this variation: omit the minimal sugars. Even when you do this, these muffins are still fabulous. I must admit … I sometimes have 2 per day … one for breakfast and one as an afternoon meal … they are THAT GOOD! Pass this one along to friends and family … you will be glad you did! Preheat oven to 350 degrees. Prepare muffin pans with a nonstick cook spray or use paper liners. This recipe does not require a mixer ... simple and delicious!!!! Mix together the Scottish oats or ground oatmeal, protein powder, flax meal, oat bran, brown sugar, baking soda, baking powder, salt, and cinnamon, set aside. Mix grated carrot and apples into the dry mixture with a spoon until well combined. The mixture will be very thick moist. Stir in walnuts. In a separate bowl, beat eggs, vanilla and milk together. Pour this mix over the prepared ingredients, and stir until well combined. Fill muffin cups ¾ full (sometimes I take it all the way to the top). Bake at 350 degrees for 15-20 minutes. I find that darker pans cook faster and the product will be done at the 15 minute timer. This recipe yields 12 power packed muffin ... Enjoy and Stay Healthy!!! Substitute the carrot and shredded apple for equal amount pureed very ripe banana. All other ingredients are the same...cooking time is the same. FABULOUS ... OH ... I reduced the brown sugar to ¼ cup as the bananas were very ripe and sweet. Substitute the carrot and shredded apple for equal amount of steamed, peeled sweet potato (3-4 small potatoes scrubbed and placed in large pot with steamer, cook for 20 minutes or fork tender, let cool to warm, cut in half and squeeze the potato to remove skin ... easy peel method), reduce sugar to ¼ cup, reduce milk to ½ cup. I had to cook this variety a full 20 minutes, but check at the 15 minute time as ovens vary. I also tossed in a handful of dark chocolate chips in ½ the batter to try it ... FABULOUS AS WELL!! !